Crane120-10.5, mede by ABC PRODUCTS Germany, is a very light, yet solid and stable crane. 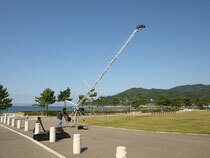 This model is used for broadcasting FIFA World Cup Soccer games. You can choose the arm length from 6m to 10.5m in 4 levels. 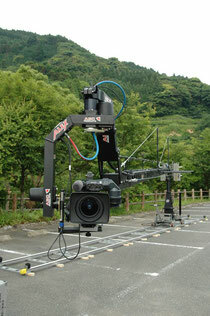 This crane works with the remote head ALEX by ABC PRODUCTS. It sits on either Bullstand Tripod, or Dolly CD5 by Movie Tech. 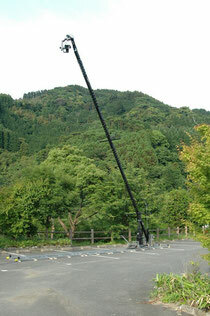 Speedy crane 9 is a light weight, easy to handle middle size crane. You can choose 4 levels of arm length. It takes only 20 minutes to set up, and it only weighs 18.6 kgs. You can enjoy wider range of camera motions by putting a remote head with it. This remote head features digital motors for smooth, fast, and stable camera motions. Both panning and tilting speeds are variable. All the important features of the camera such as REC, zoom, focus, and iris controls are set on the consoles. It takes only 3 seconds to complete 360° rotation. It runs on 24V batteries for any kinds of shooting locations.